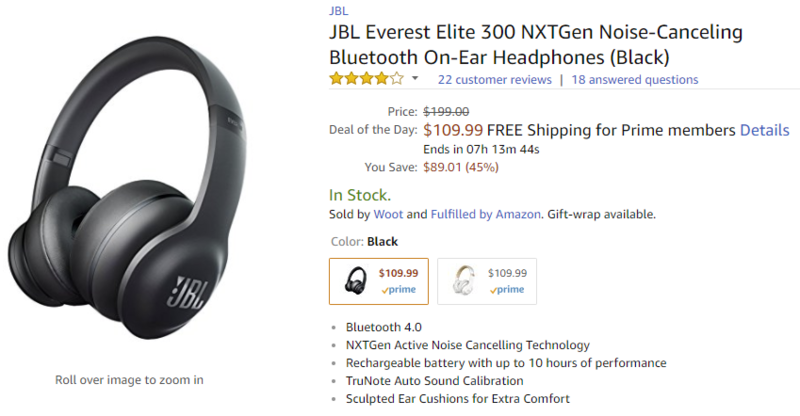 These particular headphones are Amazon's deal of the day, so you'll want to act fast. The promotion ends in a bit under 7 hours, at the time of writing. We've never reviewed them ourselves, but JBL's been producing some choice headphones for a while, now. They're Bluetooth 4.0, with a 10-hour rechargeable battery, echo-canceling microphone, NXTGen Active noise canceling, and TruNote Auto Sound Calibration that automatically tunes the headset to improve audio quality. If that isn't enough, there's even the My JBL Headphones app for further tweaks and customization. Not a lot of time left on this deal, so I'd hurry to Amazon if you're interested in picking it up. For the last week they've been $200-180 over at the retailer, so this is a decent $70-90 discount.